A few hours later Xiaomi team released the MIUI 9 China ROM for the Redmi Note 4 and 4x, and now Official MIUI 9 ROM for Mi 6 is available for the download. The latest Android 7.0 nougat update comes with some new features and new themes. It’s a major update and much faster and smoother than the previous MIUIO 8. Many Xiaomi users are waiting for this update for a long time and now the MI 6 users can apply this MIUI 9 update on their phone and enjoy the new features for the firmware. The new MIUI 9 update is released for the beta tester users, but we managed to grab the download links of this new Official MIUI 9 ROM for Mi 6. So here in this guide, we will show you how you can install this update on your MI 6 phone. Below you can find the alpha and beta builds of the MIUI 9 China ROM. The alpha build is much stable than the beta one and comes with more feature as compared to beta. Both the build are for the Chinese ROM and comes with some bloatware. And yes in these builds you can’t find the Google applications, but that’s not a huge problem, you can install the Google apps from the MI App store easily. Both the files are fastboot files and to flash these file you need an MI flash tool. So let’s get started and update the MI 6 with MIUI 9 ROM. Do take the full backup of your phone. This process will delete all the data from yourphone. Download MI flash tool here, to flash the MIUI 9 on MI 6. ADB and Fastboot driver to connect your phone to the PC. Make sure that battery of your phone is above 60%. As we mentioned earlier that these are the Fastboot files and not the recovery files. So you need to use the PC and Mi Flash tool to apply this update on your Xiakomi MI 6 phone. NOTE: – These are the Chinese ROM and doesn’t come with the google play store and you need to install Google apps separately. The process is simple and all it takes 10 to 15 minutes to complete the whole process. Just install the MI flash tool application on your Windows PC and Flash the ROM file with the help of Flash tool. Here are the detailed instructions and a video which you can follow and update your phone with this latest MIUI 9 update. Open the MI Store application on your phone and search for the Google. Now run the Google app and this will install all the latest google application on your MIUI 9 phone. See the video below. 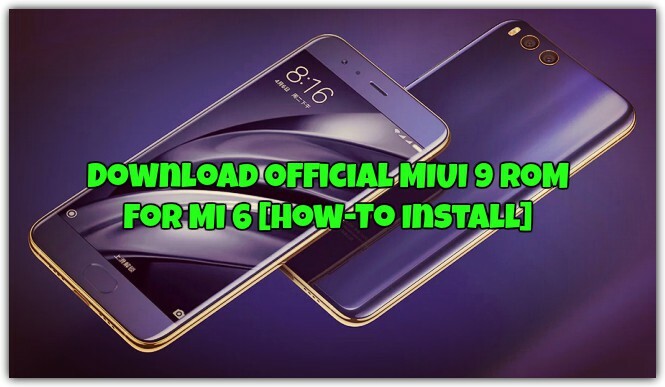 With this guide, you can easily install the Official MIUI 9 ROM for Mi 6. Hope you guys like this guide, if face any problem or any question then leave the comments below.